The box contains 3 pairs of silicone tips (S/M/L) of a good, soft, matte quality finish with around a medium bore diameter tube. It also has the 3.5mm single end detachable MMCX cable with an in-line one button mic guided by memory wire and of course the pair of iems. The Lazada seller added a nice velvety pouch that's not really part of the package but is a nice touch since there's nothing else in the box besides those 3 things. The Kinera BD005 is a relatively small, light, flat and compact IEM that holds one Dynamic Driver and one Balanced Armature driver in a clear colored plastic shell. As a whole, the BD005 feels solid despite it's weight and with it's size, it can easily lie flat in your ear. 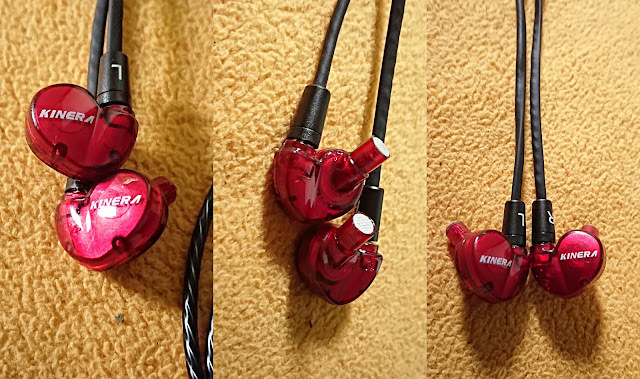 One thing though, is that the sound nozzle does not have a tip lip and the insertion end stop is very near the body, so it can seem like a shallow fitting IEM when you slide the tips in place. 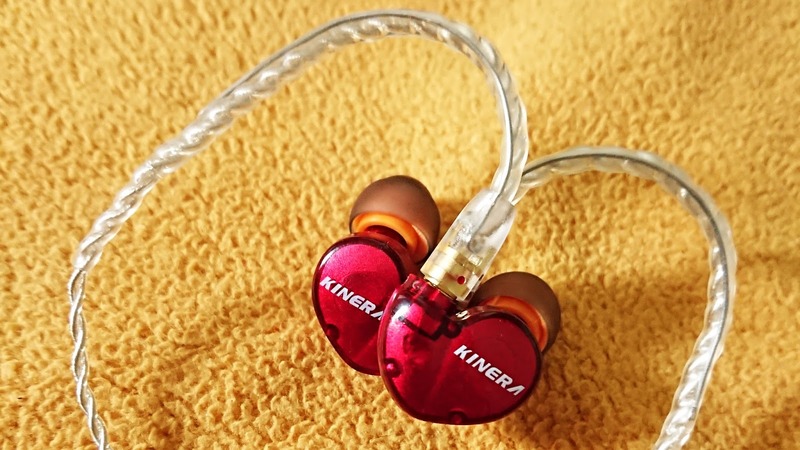 So depending on how your ears are shaped, this could mean a comfortable fit or a shallow falling out of place iem. My ears need a longer reach to have a better seal (and I don't have double or triple flange tips at the moment) so one solution I thought of was to use the largest tip and it sealed well enough. Another, is a little mod I did (as seen in the picture) which is cutting a small portion of an unused silicone nozzle tip and place it near the bottom of the tube, basically raising the reach of the tips you use. Just be careful enough to leave ample space for the tips to cling to the nozzle so it doesn't get left in your ear. The wire is soft and flexible enough for most people and seems sturdy as well with the strain reliefs built with it. The memory wire is something of a love hate thing, for me, it's ok enough as it helps keep the wire behind your ear well, but can be a bit distracting and hard to maneuver at times. With the AP200 you know it's there, you can feel it. It's just not that strong (aka not basshead satisfying) but does not bleed into the mids. Bass quantity is good with a relatively fast decay. On the WM1a, bass is fuller, deeper, a bit stronger and you can feel it on bass heavy tracks (like Cheap Thrills). Having better sounding bass, it still doesn't bleed into mids and overall bass is more than the AP200 and decay is more or less the same. Female vocals are pretty good on both WM1a and AP200 and overall a notch better than most male vocals. On the AP200 instruments are good and sound neutral in position, female vocals are a bit breathy, a tiny bit above neutral to almost forward. Male vocals are more neutral though not recessed, overall, the sound and instruments in the mids are a bit rounded but clear. With the WM1a, the sub/bass gives piano slams more body but doesn't muddy the mids, vocals seem a bit more forward than the ap200 and sound sweeter, instruments are a bit crisper, less rounded and clearer. Generally exceptions for male vocals exist and are likely due to mastering and recording as Lauv, Martin Garrix, Ed Sheeran's voice is actually at almost par to at par with female vocals in terms of forwardness and body. The AP200 highs are rounded off and not extended so there is no sibilance at all, there is a bit of crispness and almost some sparkle on the highs specially with cymbals, high hat taps, some strings and piano strikes. 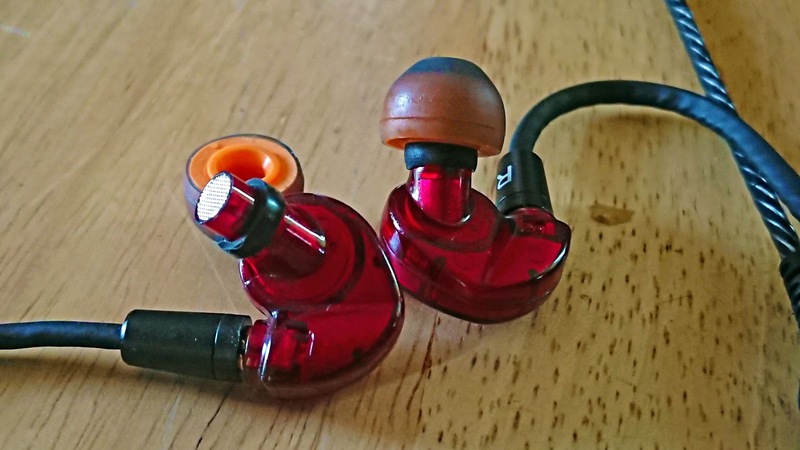 While the WM1a highs are less rounded, and a tiny bit extended. Just as with the AP200, there is no sibilance, there is more crispness and more sparkle in the highs. On the AP200 there is good enough space, you can feel the instruments and singer is near you but not in a breathing in your ear kind of way. Instruments are separated and can be ear identified/positioned with a bit of effort. 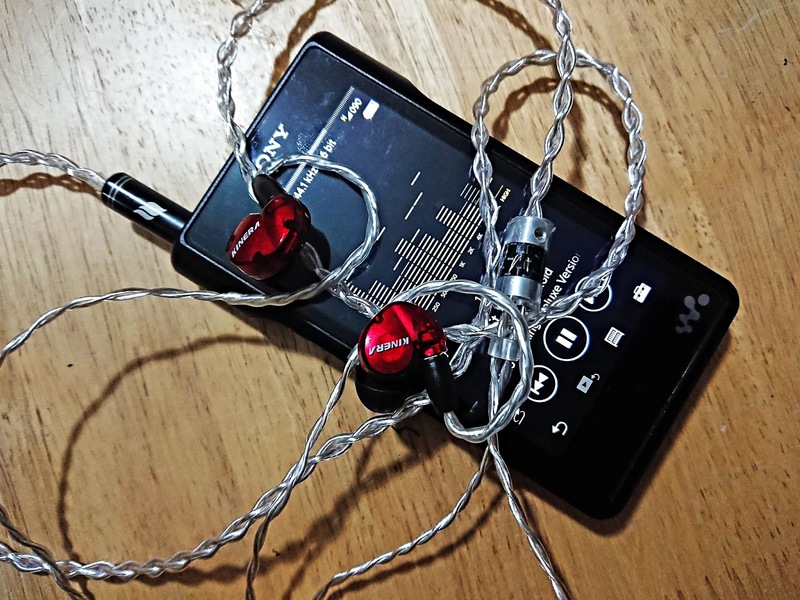 The WM1a is a bit better as there is more distance between you and the music, instruments sound more separate from the accompanying sound, making it easier to hear them and place them.. Bonus, Binaural Test via Virtual Barbershop: Both are pretty good with positioning and distance, the AP200 feels a little bit closer versus the WM1a which also adds a bit of crispness to the layering of sound (plastic bag over head, background guitar playing and the barber talking all of the same time). AP200 clarity is pretty good, instrument nuances/differences can be heard well (Deeply Disturbed, Discover Tokyo). Instrument reverb/distortion is not muddled or blurred (The Day the World Went Away, Lithium) while the WM1a clarity and instruments are a few notches better overall. The BD005 is a fun little IEM with a warm bassy signature and neutralish mids and highs that respond well with the source used and at good value for the price. 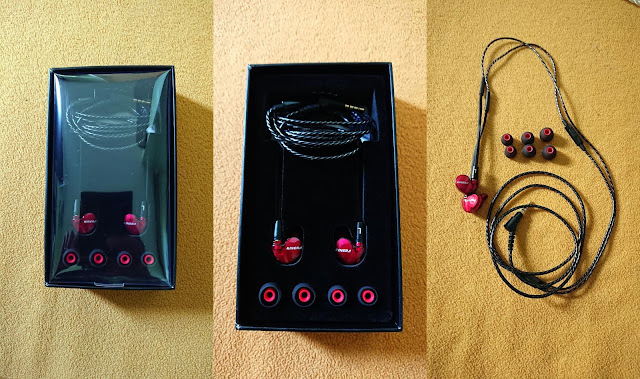 A warm DAP will emphasize the lower frequencies more and will sound bass heavy (Sony Xperia Premium) and keep the mids and highs nearly the same, while driving the BD005 with more volume and power (high gain) does not distort the sound. Using balanced cables (Effect Audio Thor II) the spaciousness and clarity sounded much better and a little bit brighter. During the time I have used this (and still do on rotation), I have enjoyed it more on my phone as it's warm signature compliments the BD005 well. 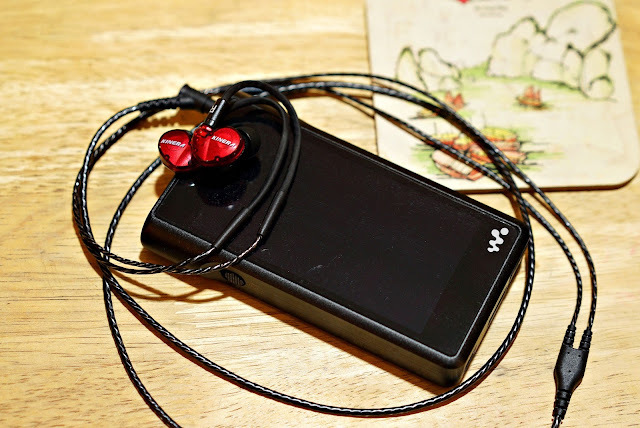 Just know that the BD005 isnt very sensitive so top volume may not be loud enough for some on some phones (Xperia's being what they are, my Huawi P9 plays music louder) while using better daps allow it sound better with more quality, but the player's signature affect the bass a lot, like with balanced players having the least amount of sub bass. Of course, adjusting the EQ can easily compensate for this and help tune it more to your taste.